After a satisfying meal at Su Hang, it was time for Pomegranate and I to make the trek back to Grand Performance Auto to pick up my dad's car. However, we stopped by at Parker Place first. Originally, I was going to pick up some more Xiao Long Bao at the food court. However, it turns out that Pomegranate had a "stomach malfunction". Well, at least this time, we know it wasn't anything we ate because I felt fine and I made sure he stayed away from raw dumplings (see Fu Lin Hot Pot). While he was doing his thing in the restroom, I spied the resident BBQ Meat shop at Parker Place. I've purchased stuff from here before an d remembered that it was quite good. Gives HK BBQ Master a run for its money in fact. Thus, not having anything planned for dinner, I decided to get some items. While I was waiting for my BBQ meats to be chopped and packaged, I was explaining to Pomegranate what was in the adjacent refrigerated display. There was cuttlefish, jellyfish, pork intestines and pig tongue. Pomegranate was none too impressed with some of the items. That is when the guy behind the counter and I started some small talk in Cantonese. He ask me to convince Pomegranate to try some jellyfish. I hinted to him that it was probably no t a good idea. That is when he exclaimed that he was able to convince some German tourist to try the pig's tongue. Hmm... impressive; but I'm sure Pomegranate was not in the mood for anything like that. Immediately after I paid, we hastily sampled the Roast Pork. It was freakin' awesome. 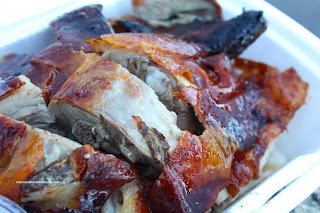 The crisp skin gave way to tender, fatty meat which had a nice roasted flavour. The crackling was very easy to eat. 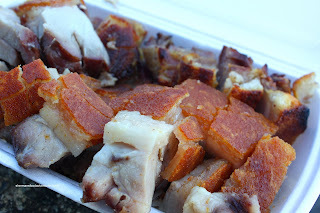 If you've eaten a lot of roast pork, you'll know what I'm talking about. Sometimes, the crackling is so tough, it cannot even be chewed. We only wished that they let up on the salt a tad. The BBQ Duck had a nice colour to the rendered skin. Unlike the roast pork, the duck was not salty. In fact, I could still taste duck. Another solid product. Too bad the BBQ Pork was no longer warm when I took a sample of it. As you can see, the fat had already congealed. Despite this, it was still pretty good with a nice sweetness to it. This is good BBQ, no doubt about it. 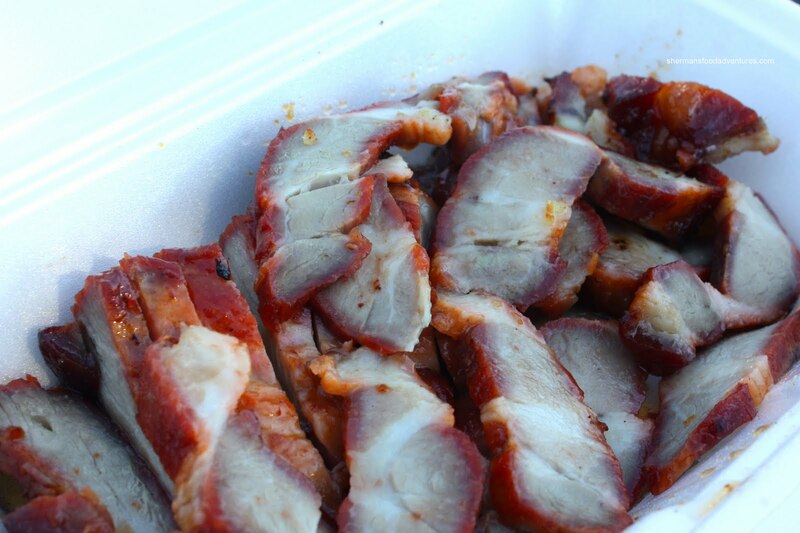 Maybe a shade below HK BBQ Master; but a whole lot better than the stuff you can get at T & T.
I agree. HK BBQ Master is still No 1. Parker Place is good second option if you can't find parking at Superstore. I can usually find parking on the roof top if the ground floor is full. 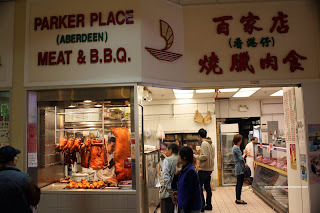 "While he was doing his thing in the restroom, I spied the resident BBQ Meat shop at Parker Place." [shakes head] .... I've come to expect better writing from you, Sherman, LOL. Holly, yah and I are on the same page!